The group of participants, staff and kids on a team building retreat. 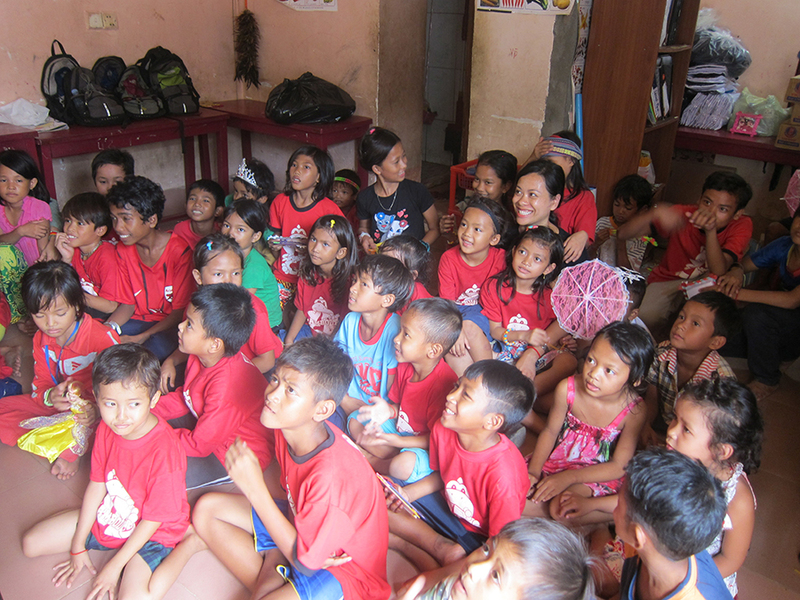 Makara and the children working on their ABCs during the summer 2014 journey. Makara was a well loved “cher” (short for teacher) and the kids frequently attached themselves to her. In this final visit to the school, some of the girls surrounded her and refused to let her go. 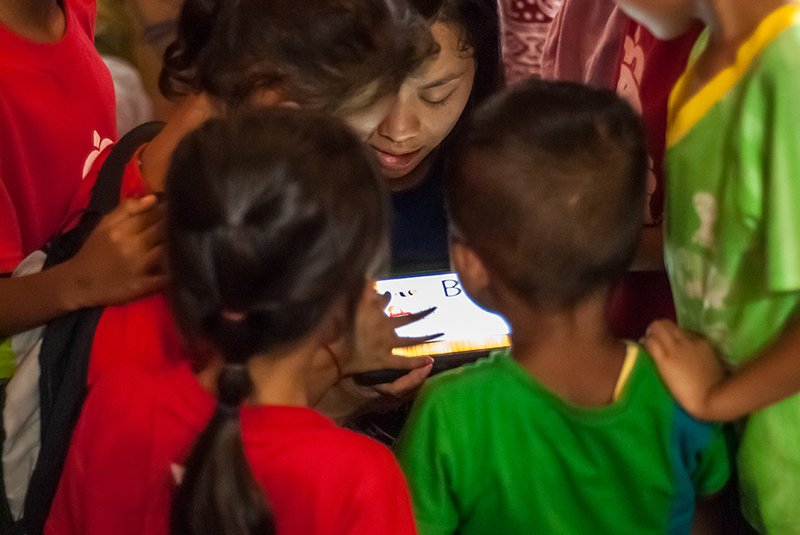 One of the most important ways for us to connect with the children were through team building exercises, sharing music, and fun games to promote bonding and relationship building. 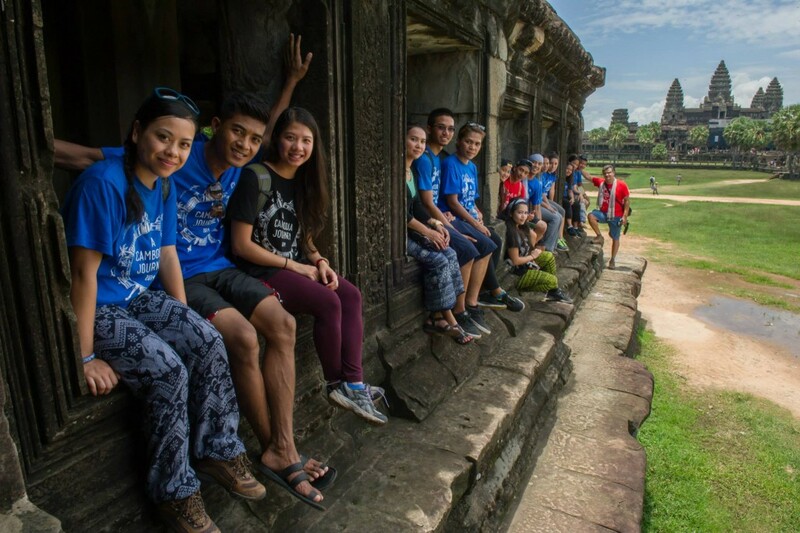 Understanding Cambodia’s history and culture are also very valuable aspects to the program. Having this understanding of current climate of Cambodia as a direct result of its historical moments guides us in providing better and more sustainable services. Thank you for taking the time to learn about Our Cambodia Journey. Below is our open letter from our gofundme fundraiser page. It was written in the spring of 2015. Since the publishing of this letter, we have completed fundraising and attended the summer 2015 service trip. We could not have done this without generous private donations, GoFundMe, Pho Cambodia’s Sake Cooking Classes and Canvases for Cambodia Painting Classes. HUGE thank yous to everyone involved in making this happen. Upon our return, we have begun blogging about our experiences at makarasernett.com. If you are interested, please take a moment to read about our kids stuggles, their achievements, and our journey. As many of you know, Makara and I have decided to raise money for a program that we firmly believe in. The program is run by the YMCA of Greater Long Beach and Khmerican, Inc. in conjunction with Cambodia YMCA and Cambodia Together Association Street Children Project. The program serves to assist many impoverished children and families in Cambodia, as well as provide cultural immersion to the participants. Essentially your donation will serve as a catalyst to provide opportunities to those that are less fortunate than many of us and we hope that you will support us. Makara had the amazing opportunity to participate in this last year thanks to the generosity that many of you had shown. This time I am blessed to be able to join her in this incredible journey. You may not have known this, but Makara and her family have roots in Cambodia. Her family resided in Tra Vinh, Vietnam where she was born. Tra Vinh is a town in the Mekong Delta which was a part of Cambodia until the 1970s when it became a part of Vietnam following their independence from France. The result was an indigenous population of millions of Cambodians that were targeted by the Khmer Rouge for supporting U.S. forces during the Vietnam War. Makara’s parents escaped on foot by travelling through the Mekong Delta and Cambodia until they reached refugee camps on the border of Thailand. That’s where they lived for almost a decade until her grandfather was able to sponsor them all to the United States. Her grandfather had served alongside the US forces during the war and was granted sanctuary as a result. Makara’s childhood and the livelihood of her parents were very similar to the realities experienced by so many children and adults in Cambodia. This is true in many countries, but because of Makara’s roots to the location as well as my relationship with many people in the Cambodian community, we chose this as our focus area to provide assistance in any way we can. I was fortunate to have been raised under better circumstances than my wife. My mother and father provided me with an amazing childhood and the opportunity to succeed in this world. My mother grew up in less than favorable conditions in South Korea as a child so she always instilled in me the compassion to help others in need. My parents always taught me to pay it forward and to be kind to others because humans are inherently good. The biggest gift my parents gave me was education and the opportunity to do with my life what I felt was important. As a result, I desire to serve which is a large reason why I chose to join the US Army. The Army in turn has opened my eyes to the reality of life on this Earth and I want to do my part to help others when I am able. Lucky for me, I have a partner in life who has the same passion and we have decided to embark on this journey together: Our Cambodian Journey. Although I am not Cambodian, I have been immersed in numerous impoverished countries. My time in the Army has taken me to locations such as Afghanistan and Honduras where I witnessed first hand the difficulties experienced by the natives of those countries. The lack of food, water and education was astounding. Things that many (albeit not all, poverty is not a foreign concept in America) of us take for granted. Death was a common occurrence due to starvation and the lack of simple medical supplies. There is hope though. Cambodia is on the cusp of becoming a prosperous country. This program is like a seed that will sprout with patience and proper nurturing. The people that have built the foundation of the program have continued to improve it year after year. We hope that you will donate to this worthy cause and help us to help these deserving people get an opportunity to improve their situation. Cambodia, although poor, is in a position to grow into a prosperous country. The money that you provide will go to the program in it’s entirety. The money will help feed, clothe, and educate the children and people of Cambodia. We hope that this trend continues and that someday soon we will see Cambodia rise from the ashes of it’s past and grow into a country that will in turn help others to prosper. 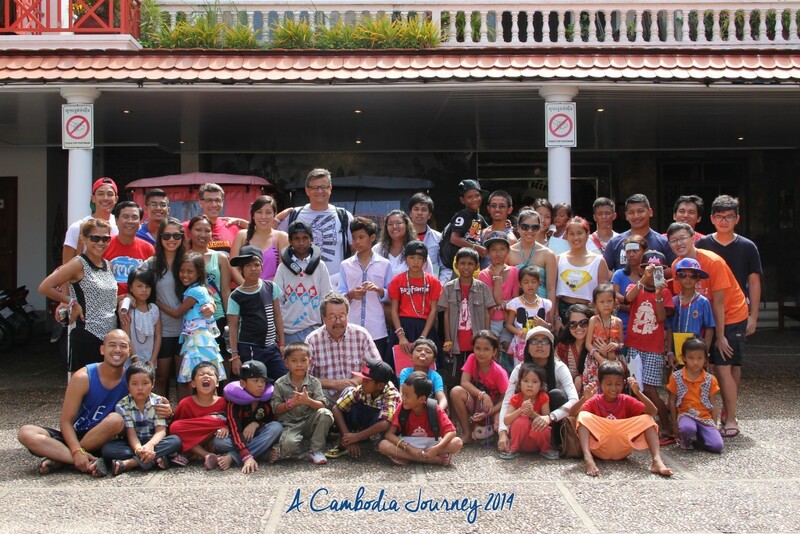 This is our Cambodia journey and we hope that you will join us in whatever way you can!